When God’s exiled people got on their knees and cried out to the LORD, he was faithful in restoring their land, rebuilding their nation, and displaying his glory among them! The North American church is in great need of a fresh visitation of God’s Spirit and there are signs of a new spiritual awakening happening all around. Many leaders are hungry for something more than “business as usual” and are asking the LORD to send the fresh rains of his Spirit over their personal lives and the ministries they lead. Each year at the Multiply Conference, we gather with leaders to be inspired, equipped, and encouraged under the teaching of practitioners who are being used by God to bring renewal and missional reproduction to their churches. These speakers challenge our thinking, stretch our vision, and call us to renewed commitment to Jesus’ kingdom cause. We look forward to what God is going to do among us during these days together and to the fruit that will follow in local churches as a result. Multiply (formerly C2C Network) exists to be a catalyst for church planting and multiplication locally, nationally and globally. We come alongside churches, denominations and individual church planters to assess, coach, train and support in order to see new disciples of Jesus made, and new congregations formed. While the majority of our work is on the front lines of church planting, we receive numerous calls every year from leaders who want to see their established congregations step into a new multiplication mindset. This conference is designed with these leaders in mind. Nine years ago, 150 leaders gathered at the first Multiply Conference (Calgary) to talk about starting new services, planting daughter churches, moving toward multi-site, and/or renewing dying congregations. Since that time Multiply has grown to become a key Canadian equipping conference for established church leaders. This will be our first Multiply Conference on the East Coast! Anyone who has an interest in disciples being made, new churches being planted, and older churches renewed! Specifically, senior pastors and key lay leaders from established churches who are thinking, dreaming, and praying about multiplication. The majority of our speakers have planted the churches they currently serve, and have lead those same congregations to multiply through planting, multi-site, and adoption and replanting of dying churches. Halifax is an ideal site for Multiply Conference! The central location in Atlantic Canada provides easy airport access for leaders across eastern Canada and the New England states. With a strong complement of both Canadian & US practitioners, as well as international guests, the Multiply Conference will benefit everyone who attends (both locals and those who come from away!)... You will receive some of the best resourcing offered today. Recent studies indicate that 90% of North American Churches will never daughter a church. If we are to see the re-evangelization of Canada, we need an army of established churches to engage the vision, and embrace the challenges of “giving birth.” In this breakout topic, you will learn from practitioners who are leading church-planting-churches. They will share key learnings, obstacles to overcome, and the joy of sending leaders to start new congregations. Multi-site, satellite, campuses, video venues, teaching teams, re-plants, and networks of stand-alone churches are just some of the many “faces” of the multi-site church world. If you are considering moving toward a multi-site model of ministry, this breakout topic will inspire and equip. Seasoned leaders will share some of the latest trends as well as their key learnings from their particular model. In a cultural movement that is post-Christian, postmodern, and post-social. How can we most thoughtfully and faithfully share the life transforming message of the Gospel? Explore how the church can bring people into relationship with Jesus through the community of the church. As we contend for faith in Jesus in our current cultural moment, it may be easy to conclude that we are in a moment of crisis. What if this moment is not a moment of crisis, but one of opportunity? What if it is this very moment, that God wants to renew the church in the West? This session will layout a map for understanding our cultural moment and reframe it from crisis to opportunity. Creating a culture of Evangelism is essential in engaging faithfully as the people of God. How can we turn up the evangelism temperature in our churches and church plants? How can we cultivate gospel ecosystems where the people of God are equipped and released to share their stories and participate in advancing God's kingdom in our cities. This session will unpack the key elements of creating a culture of evangelism. The story of scripture is; God presence with His people and expanding His presence in the world. The book of Acts kicks of with resurrected Jesus commissioning his disciples to wait in Jerusalem for the Father to send them the gift of the Holy Spirit before they are sent out to be his witnesses to Jerusalem, Judea and to the ends the earth. The same commission is given to every subsequent generation; to take the glorious life transforming gospel to the nations through the empowerment of the Spirit. This session will look like what it means to develop a culture of encounter in your church. The Kingdom of God is the reign of God. It is Jesus Christ, the Lord over all things, in action. Wherever the will of God is being done, that’s where the Kingdom is being manifested. In a very real sense, Jesus is the Kingdom in person. Focusing on the Kingdom moves us from conversion to transformation, and from segmentation to integration. This is the framework and the focus for everything we do. Helping people hear and obey God is the goal. A disciple is not just a church member or someone who knows a lot about theology. It is someone who is an obedient follower of Jesus led by the Holy Spirit. Under the Kingdom framework, society is the grid in which we operate. The Kingdom framework moves the church from attractional (“come to our church”) to engagement with people. Every person in your church is on mission where God has placed them in society. The Kingdom framework moves us from individualism to family, and from tribal faith to global Church. We build the church not as a result of a building but a called-out people who submit to the rule and reign of God. Many have said that “everything rises and falls on leadership.” But in Jesus’ up-side-down kingdom, what kind of leader does it take to grow a sustaining ministry, disciple deeply, plant churches and/or start movements. In these sessions, we will press into the deep work of the Holy Spirit in the life of the leader, and a rich understanding of the lavish grace of God. Grace sets the leader and his people free from striving, guilt driven ministry and pressure to perform. I had been serving God for several years when a fresh revelation of God’s lavish grace changed everything and has enabled me to stay on the journey for 50 years. The gospel really cuts you loose. If the leader enjoys and preaches gospel freedom, he can encourage and lift his people out of secret guilt into the liberty which Jesus promised. Church multiplication follows where God’s people are truly released from secret sin and shame. In the book of Revelation Jesus says “I know your works.“ It’s so possible to offer him work that doesn’t impress him or earn any reward at all. It might look outwardly impressive, but is it what he really wants? Some will be rewarded. Some will suffer loss. (1 Corinthians 3:14-15). Which will it be? Let’s make some life changing decisions. No one would argue with the premise that gospel-centred churches must be driven along by gospel-centred proclamation, however, far too many leaders over-look the necessity and the power of gospel-centred liturgy that lifts-up, exalts, and magnifies the gospel message in every aspect of the gathering of God’s people. Far more than being the “warm-up” for the “real meal” of preaching, a gospel infused liturgy declares the glories of the gospel in word and in song. 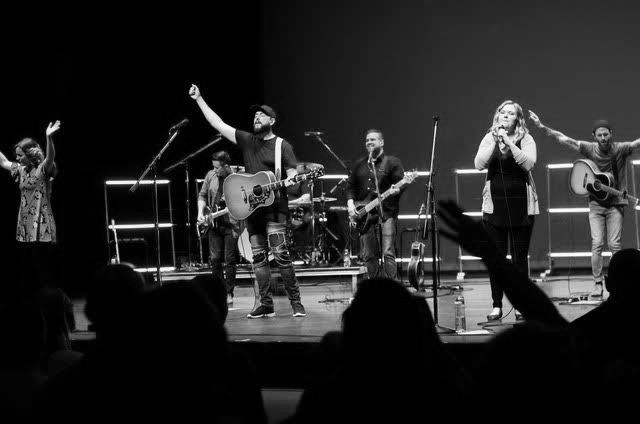 Great “worship” is far more than great music. Oh how we need to encounter the living God every time we gather as His people under the banner of the cross! Eugene Peterson says, "The word busy is the symptom not of commitment but of betrayal. It is not devotion but defection.” Jesus said to Martha, “Martha, Martha, you are anxious about many things, but one thing is necessary.” A question we should be asking of our ministry is, “Has the busyness of ministry taken me away from “one thing” Jesus was taking about? Session #2: Are we in Danger of Proclaiming Another Gospel? Is it possible that we’ve lost sight of what our Sunday gathering is all about? Could we be "worshiping worship” instead of the Triune God? God is the gospel. If this is true then our Sunday gatherings must be centered on God. Worship begins and ends with God. In Col 1:9-12, Paul prays that we would be 'fruitful in every good work'. We will explore prayer as central to accomplishing the Mission of God and attempt to offer practical applications that will simplify what perhaps has gotten cluttered and complicated. Come prepared to both listen and participate. We say it, quote it and I try to believe it. How are we doing at living it out? Prayerful engagement is every believers invitation, not for just a few. Discovering meaningful ways to integrate prayer into all aspects of ministry. The disciples' response to Jesus after observing him in prayer was to say, 'Lord, teach us to pray'. We will explore the simple petitions outlined in this prayer and discover that it provides a path of discipleship for all believers. 7 PM - 9 PM "Undivided: One Church, Many Peoples"
Rooms in Howe Hall offer private accommodations with shared, gender-neutral washroom facilities accessible from residence hallways. Toilet, tub and shower stalls within washrooms provide a high level of privacy. Suite-style residence building provides private accommodations with private washroom facilities, kitchenettes, living areas (kitchenettes and living areas not available in 2 Bedroom Shared Washroom) and air conditioning. Fully accessible rooms are available upon request for those with medical needs. Kitchen Kits (featuring pots, pans, utensils, etc.) are available to rent (subject to availability). Rates are subject to a 2% city marketing levy and 15% HST; rates are non-commissionable. – When making your reservation, use promotional code "MULTI19" to book accommodations in the conference block. – Please note that any student must present a valid student ID upon arrival in order to receive the discounted student rate. – If you require any assistance, please contact Dalhousie University by email (stay@dal.ca) or phone (888.271.9222) and one of their associates would be happy to help. The Multiply Conference is an exciting two days. We are looking for volunteers to join our team and help make the Multiply Conference a great event!